Over the years, Greg ‘s expert advice and opinions have been solicited by numerous media outlets. As a result, Greg has had the good fortune to present his thoughts in a number of formats, whether speaking on TV and radio or being quoted in newspapers and magazines. Below are links to many of those appearances and articles. As an added bonus, we’ve provided a link to a TV commercial that Greg created and produced in 2005. Greg shot a commercial that ran in the Westchester area of Cablevision during much of 2005, and then again in 2006 during the Winter Olympics. If you’d like to see the spot, please click here. Please note that the phone number shown is no longer Greg’s work number. Greg was a frequent guest analyst on the Fox News cable channel from December 2002 through September 2004. In fact, he was a regular contributor to shows like “Your World with Neil Cavuto”. Please take a moment to view some of Greg’s appearances by clicking on the links below. These video clips are best viewed with a broadband connection. In December of 2002, Greg Werlinich made his first appearance as a guest analyst in the “Makers and Breakers” segment of the Fox News show “Forbes on Fox”. View the video. On November 10, 2003, Greg Werlinich made his first appearance as a guest analyst on the Fox News show “Your World with Neil Cavuto”. View the video. On December 3, 2003, Greg Werlinich again appeared as a guest analyst on “Your World with Neil Cavuto”. View the video. On December 20, 2003, Greg Werlinich made his first appearance as a guest analyst on the Fox News show “Cashin’ In”. View the video. On February 9, 2004, Greg Werlinich again appeared as a guest analyst on “Your World with Neil Cavuto”. View the video. On March 5, 2004, Greg Werlinich again appeared as a guest analyst on “Your World with Neil Cavuto”. View the video. On April 9, 2004, Greg Werlinich again appeared as a guest analyst on “Your World with Neil Cavuto”. View the video. On April 10, 2004, Greg Werlinich again appeared as a guest analyst in the “Makers and Breakers” segment of “Forbes on Fox”. View the video. 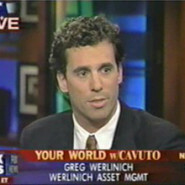 On May 11, 2004, Greg Werlinich again appeared as a guest analyst on “Your World with Neil Cavuto”. View the video. On June 3, 2004, Greg Werlinich again appeared as a guest analyst on “Your World with Neil Cavuto”. View the video. On August 16, 2004, Greg Werlinich again appeared as a guest analyst on “Your World with Neil Cavuto”. View the video. On September 22, 2004, Greg Werlinich again appeared as a guest analyst on “Your World with Neil Cavuto”. View the video. Over six consecutive weeks in the summer of 2011, Greg appeared on WFAS AM, a Westchester, New York area radio station on a program called “Ask The Expert”. Unfortunately, the recording of one week was lost, but the other five weeks are provided below. Each week Greg discussed a variety of topics relating to investing and the stock market, and answered numerous questions asked by callers. I hope you’ll enjoy listening to these recordings as they are very informative and entertaining. During the first show, Greg reviewed the differences between investment advisors and stock brokers, the types of clients he works with, how he manages money and his core investment themes. Click here to listen. During the second show, Greg gave reviewed the basics of investing; kind of an “Investing 101”. Click here to listen. During the third show, Greg continued his review of the basics of investing, including a discussion on some of the key differences between investment professionals, how to choose an appropriate advisor and a glossy of the language of investing. Click here to listen. During the fourth show, Greg shared some insight into how he chooses his investment themes and the how he picks the particular securities that he invests in on behalf of his clients. Click here to listen. During the sixth and final show, Greg gave some background on how he got started, how he grew his business, what the profile of his typical client is and what services he provides to those clients, and how he can be reached. Click here to listen. Greg was interviewed for an article on the unemployment rate in the October 10, 2005 edition of the Arkansas Times Record. Click here to read the entire article. Greg was interviewed for another article on the unemployment rate in the November 16, 2005 edition of the Arkansas News Bureau. Click here to read the entire article. Greg was interviewed for an article on ETF’s in the March 27, 2006 edition of Investment News.com. Click here to read the entire article. Greg was quoted extensively in an article on international investing in the November 2006 issue of Financial Advisor magazine. Click here to read the entire article. Greg was interviewed for an article on the benefits of end-of-year tax-loss-selling in Barron’s on November 3, 2008. Click here to read the entire article. Greg was interviewed for an article on leveraged ETF’s that appeared in Barron’s on October 12, 2009. Click here to read the entire article. Greg was quoted in an article by Emma Trincal about Structured Products in the April 27, 2010 edition of The Prospect News – Structured Products Daily. To read the entire article, click here. Greg was again quoted by Emma in an article about high yielding products in the April 30, 2010 edition of The Prospect News – Structured Products Daily. To read the entire article, click here. Greg was again quoted by Emma in an article in which he discussed the merits of a unique structured product in the September 14, 2011 edition of The Prospect News – Structured Products Daily. To read the entire article, click here. Greg was again quoted by Emma in an article in which he looked negatively upon a new structured product in the October 25, 2011 edition of “The Prospect News – Structured Products Daily”. To read the entire article, click here. Greg was again quoted by Emma in an article in which he discussed the merits of investing in a new structured product tied to the price of gold. You can read the article in the March 14, 2012 edition of “The Prospect News = Structured Products Daily” by clicking here. Greg was again quoted by Emma in an article in which he discussed the merits of investing in a new structured product tied to the value of the EAFE. You can read the article in the July 19, 2012 edition of “The Prospect News – Structured Products Daily” by clicking here. Greg was recently quoted by Emma in an article in which he was pessimistic about the prospects for a structured product tied to the Russell 2000. You can read the February 13, 2013 article by clicking here. Greg was interviewed by Greg Brown in an article for Newsmax entitled “After the Gold Rush” in which Greg shared his bullish views of gold. You can read the entire article by clicking here. Greg has also been quoted more than a half a dozen times in the Westchester County Business Journal. Unfortunately, those articles can no longer be accessed. Greg was a regular contributor to the interesting and provocative weekly pod cast on Wallst.net called Ahead of the Curve with Bobby Ilich. Each week Bobby moderated a lively debate between two market experts about hot topics in the stock market. Greg had the pleasure of appearing more than a dozen times before Bobby stopped doing the show. Greg was twice a guest analyst on the syndicated radio show, “It’s Your Money”, hosted by Bill Bailey. The show was also streamed on the web, but recordings were never made available to us for distribution. Greg was interviewed for a podcast in which he discussed sector rotation investing. Unfortunately, that interview is no longer available.